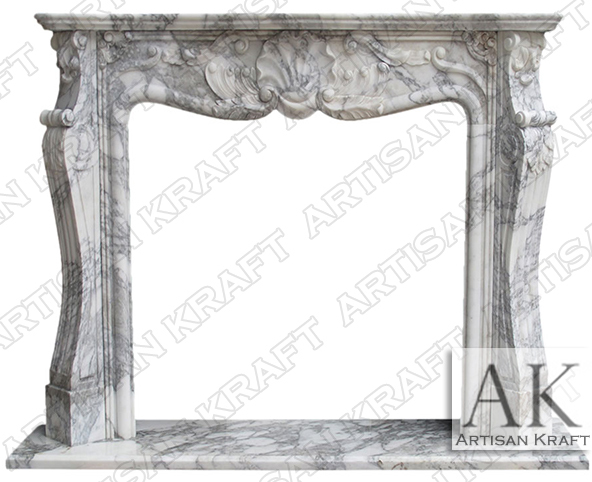 Intricately hand carved floral details in the header of this Old World French mantel made from Italian marble. Marble is polished and comes from Italy. Often this stone is confused with Carrera but if you look closely the differences are evident. Decorative carvings are hand carved details. Can ship in 1 to 3 weeks. S scroll corbel legs stand tall under the Italian Arabescato shelf. This is an expensive beautiful fireplace. St. Louis Italian Arabescato marble in the image. Other French style mantels can be purchased from our website.